Losing weight is one of those things that are much easier said than done. In theory, all you need to do to lose weight is consume fewer calories than you spend, but we all know that it doesn’t always work like that in practice. Food nutrition labels are often inaccurate, daily stress can slow down the human metabolism, and tight schedules make regular exercise problematic. With this in mind, it’s safe to say that any tool that can make losing weight easier is worth trying. The iPhone weight loss apps featured on this list are endorsed by thousands of satisfied users who have transformed their lives thanks to them. Hate it as much as you want, calorie counting is the best way how to lose weight. Without knowing exactly how many calories you need to consume each day to lose weight, all other efforts are likely to have little to no effect. You can either spend a lot of time every day with pen and paper to manually count your calories, or you can download the Lose It! app and let it take care of everything for you. The app uses the camera built into your iPhone to intelligently identify the foods it sees, greatly simplifying the process of counting calories. Just verify the app’s suggestions, and you should be good to go. Apart from this, you can also manually search a huge database with more than 7 million items and read weight loss tips written by nutrition experts and professional personal trainers with years of experience. If you would like to go beyond calorie counting and track other things that affect how much weight you lose, you can connect the Lose It! app with your fitness devices. The Calorie Counter & Diet Tracker from MyFitnessPal doesn’t do as much compared to many other weight loss apps, but what it does, it does extremely well. The core of this app is a huge database with over 5 million foods. Included in the database are individual raw ingredients, complete meals, popular fast-food items, drinks, and much more. You can save your favorite meals, quickly tweak how much food you’ve consumed, and even import recipes you find on the web. If you have iPhone 5S or newer, you can use the app to track your steps using the built-in step tracker. The Calorie Counter & Diet Tracker from MyFitnessPal works with over 50 other weight loss apps and devices, including Fitbit, Runkeeper, Strava, Misfit, and others. Nobody likes boring workouts. Doing the same thing over and over again gets tedious very quickly, and even the best workout plan stops being effective after approximately three months. The problem is that not many people have the time or the knowledge it takes to sit down and come up with a well-throughout workout plane. Luckily, with the Sworkit app, you don’t need to. 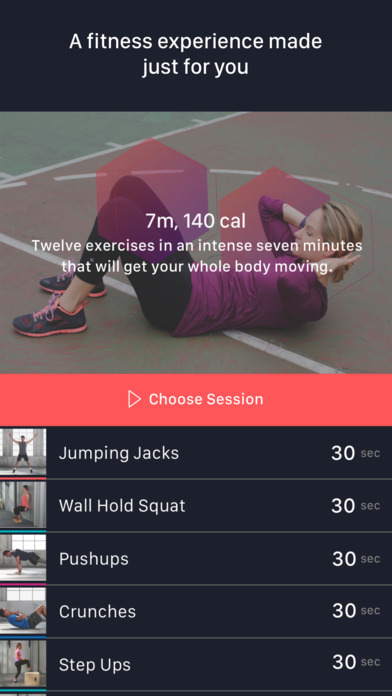 With over 40 million workouts for people of all fitness levels, this polished fitness app can help anyone get in shape. With the free version of the app, you can enter your personal information and have it come up with personalized workout plans to help you get leaner, fitter, or stronger. If you upgrade to the premium version, you get to enjoy guided workout plans, exclusive workouts and exercises, custom exercise intervals, unlimited custom workouts, ad-free workouts, and other useful features. Depending on your lifestyle, there might be days when you just chill on the couch, and there might also be days when you’re up on your feet the entire time, doing hard manual work. It makes no sense to push your body beyond its limits by strictly adhering to a rigid workout plan that doesn’t take into consideration how you live your life. Fitbit, an American company known for its activity trackers and wireless-enabled wearable technology devices, wants to make it easy to get and stay in shape with their new fitness app called FitStar. Unlike other fitness apps, FitStar works as a personal trainer who diligently monitors your progress and pushes you toward your goal. You can select routines from a database of handcrafted workout sessions with step-by-step instructions and useful fitness tips. Use AirPlay to stream your workouts to your television, and connect the app with your favorite fitness and activity trackers to get a complete overview of your fitness journey. Fitbit is the granddaddy of all fitness trackers. The official Fitbit app is designed to work with Fitbit’s many activity trackers as well as the Aria Wi-Fi Smart Scale. Depending of which Fitbit fitness tracker you own, you can track steps, distance, calories burned, sleep, weight, and more. Everything is synchronized wirelessly and safely stored in the cloud. The Fitbit app for the iOS operating system also comes with a database of over 350,000 foods and the ability to track workouts. The Fitbit ecosystem has already helped countless people from around the world lose weight, and it can help you achive your dreams.